Polish up your next marketing campaign with this customized eyeglass repair kit. 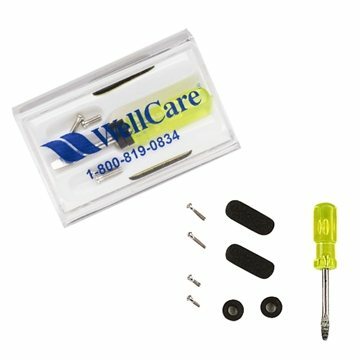 Kit includes a miniature screwdriver, screws, nose pads, and rubber bands to keep your glasses in sparkling-new condition. Also features a clear plastic case with snap closure for convenient portability. A great promotion for optometry offices! They looked more professional compared to ones we've purchased previously. this was a hit in one of our campaign launches. Flashing lights make for very good promotion. there is nothing I really dislike about the product We could not keep our shelf filled. Our sales rep Veronica provided outstanding service. the best follow-up before, during and after the sale of any company! Alicia, you are the best!!!! Really good quality for the price.